And after the war? What next for Corporal Mustin? 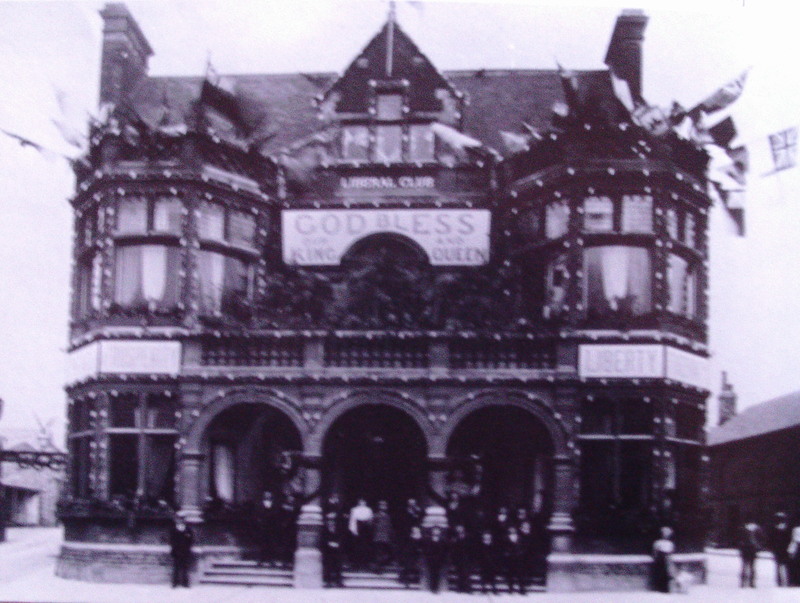 To backtrack a little, and to place him in context, before he went to South Africa, George Mustin was 25 years old, working as a printer and living in Hinckley with his Mother, who had, in earlier life, been the proprietress of a beerhouse in Nuneaton called “the King’s Head”. His Father, a stonemason, had died in 1892, but three brothers lived with them – William (a warehouseman in the hosiery industry), Oscar (a clicker in a shoe factory) and Charles (a joiner). 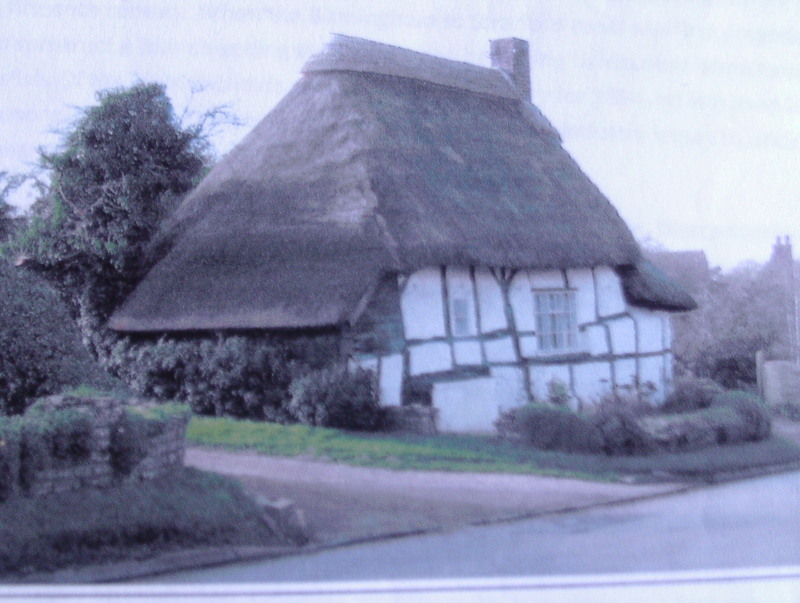 Living next door were his Mother’s daughter by an earlier marriage, Leonora (a hosiery mender), her husband and their two children. This sounds a cosy arrangement, but rather cramped, and may have made the prospect of an outing to South Africa more appealing. Soon after returning from the war (I doubt he ever left the country again), he married Rose Peto, my Great-Grandmother, and moved to Kettering in Northamptonshire (my birthplace), where he took a job as a foreman compositor with Staples the printers, continuing to work there until he retired in the late 1930s. He died in 1962, at the age of 87, two years after I was born (I have no memory of him, although presumably we met). who had begun her career working in a hosiery factory, married one Sidney Brocklehurst, a “prominent local hosiery manufacturer” who seems, like many in Hinckley, to have done quite well out of the Great War. She is the only member of this generation I do remember: a rather grand personage, she would hire a taxi for the day to drive her from Hinckley to Kettering, and remain in it as we children were led out to be presented to her. The daughter of George’s half-sister Leonora, Doris, similarly married a Major Goode M.C., another “prominent hosiery manufacturer”, and the owner of Cadeby Hall, a sizeable, but now sadly derelict, house near Hinckley. George seems to have stayed there from time to time (as did my Grandfather) and amused himself by shooting game in the grounds. Unfortunately, Major Goode died in 1934, after “an accident cleaning his gun” (a common, sometimes euphemistic, occurrence at this time). George’s other great amusement (apart from playing draughts and drinking in Kettering’s once grand Liberal Club) does seem to have been cricket. It is not unreasonable to suppose that he watched Northants when they played at Kettering (which they often did between the wars) and may well have driven (he was an early motorist) to Northampton to watch them there as well. In one account I have of him, in his later years ( I have also heard him described as “sardonic” and possessing a rather dark sense of humour), he was “a tall, white-haired old gentleman … [who] sat in his favourite chair with a cigarette or his pipe, and enjoyed hearing the cricket commentary on the radio which was close to hand … In his last years his children provided him with a television, so that he could watch the cricket as well as hear it”. I suppose he was old enough to have seen W.G. Grace in action, and just young enough to have caught the first stirrings of one-day cricket, as Northants beat Leicestershire in the final of the “Midlands One-day Knock-out Cup” in 1962. Three generations on, I find myself, in a case of, if not quite social, then, at least, physical immobility, sitting, not ten miles away, a slightly less tall, but increasingly white-haired old gentleman, listening to the cricket commentary on the radio. The major changes in the last half-century or so are, I suppose, that, whereas he had to go outside to use the lavatory, I have to go outside to smoke (and I can no longer, of course, see the cricket as well as hear it). i.m. 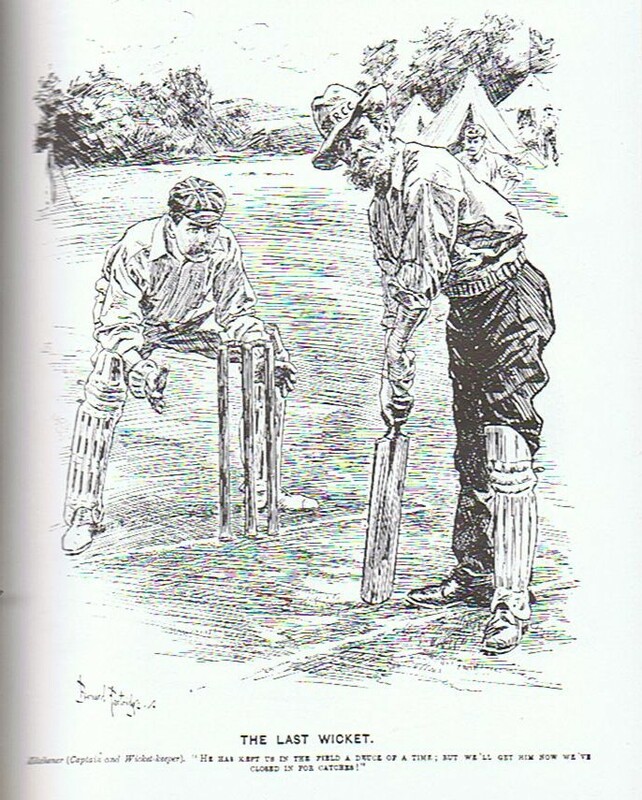 G.E.M., (1875-1962), soldier, printer and spirit of cricket. This is the last letter I have from G.E.M. to the boys back home in the Liberal Club, originally published in the ‘Hinckley Times’ of 5th January 1901. By now a difference of opinion had emerged between the two sides as to whether the war was over. The British, having defeated the Boers whenever they could catch up with them, captured their capitals at Pretoria and Bloemfontein, as well as Johannesberg, and forced their leaders to flee, thought they had won (G.E.M clearly shared this view). The Boers, unfortunately, disagreed and declined to surrender. Though the war was to drag on until May 1902, becoming increasingly dirty in the process, G.E.M. finally returned home in the Summer of 1901. One slight compensation for being stuck in South Africa, as you will see, was that he did manage to find time for a little cricket while he was there. As a 6’3″ fast bowler on what was likely to have been a primitive wicket he must have been a testing proposition. Played at Germiston on Monday, November 20th and resulted in an easy win for the Volunteers. Leicester, winning the toss elected to bat first, and were not dismissed until they had compiled the respectable score of 124. Angrave (29), Firr (26), Uncas (16) being the chief contributors. The cavalry going in were quickly dismissed for 21, Mustin securing six wickets for six runs and Firr** four for twelve runs. * The City [of London] Imperial Volunteers. If you visit the Guildhall Art Gallery in London there is a magnificent picture entitled “The City Imperial Volunteers in the Guildhall on their return from South Africa, October 1900” (see here). No equivalent picture, to my knowledge, exists of the Leicestershire Infantry Volunteers. 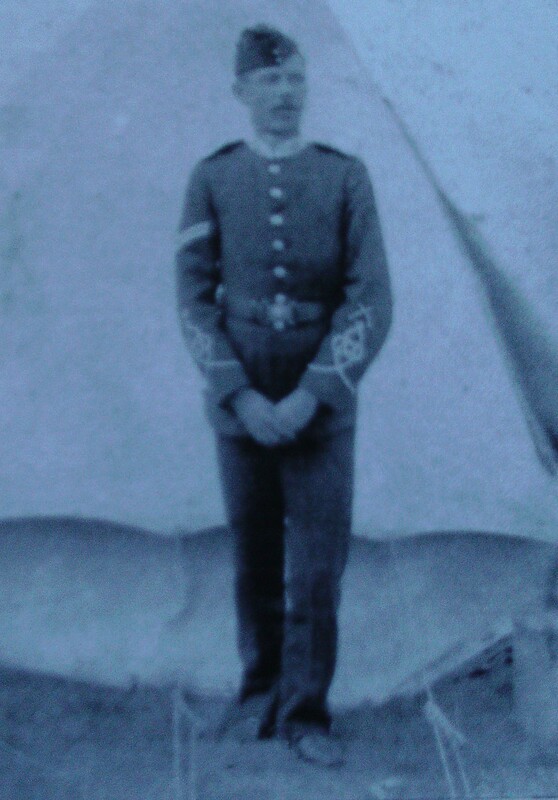 ** This Lance Corporal Firr is commemorated on Market Harborough’s memorial to those who fought in the Boer War. He may have been related to the famous professional huntsman Tom Firr. A third bulletin from South Africa, where the game of Hunt the Boer continued. 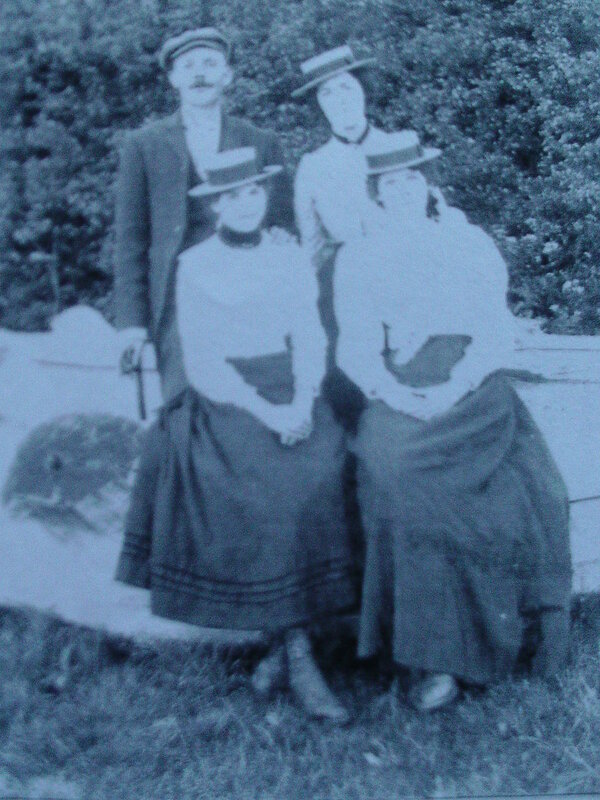 This, incidentally, is a photograph of G.E.M back home in Hinckley with his wife-to-be Rose Peto (back row) and her sisters Gertrude and Nell (all three of whom, like most in the town, were employed in hosiery factories). He doesn’t look particularly tall in this photograph, as Rose was herself about six feet tall. I was very pleased to receive your letter and to hear that all old friends were going on much the usual way. I can quite understand T.S.A. going into the wholesale rose trade, and no doubt he will be successful if his garden is as large as some of the growers who exhibit. The parcel of tobacco came to hand a few days after the letter, and I am extremely obliged for the gift … Since writing last we have changed our quarters many times … On May 23rd we left this camp, our tents etc. being sent down country and we prepared for a rough time and we have not been disappointed. We are now moving every day. Loading our waggons with greatcoats and blankets we fell in at times as early as 3.30 a.m. and one day we had marched 8 miles before daylight. On the 29th we had reached the Buffalo River, and after staying one night, we had orders to advance to Stales Drift where a commando of Boers with two guns had taken up a position. We moved off at daybreak, the Gordons advancing on our right. Our advance guard got in sight of the enemy but they scooted as fast as their horses could carry them. Soon after firing was heard and it was supposed they had come in collision with General Hillyard. After this we crossed the river and found ourselves in the Transvaal at last. A few days more marching about and we reached our present bivouac ground, Coetzees Drift, which is situated about 10 miles from Mujaba and about the same distance from Pogwani, where the Boers have large guns in position. When we arrived a three days armistice was being arranged, and it was generally thought that it would result in a general surrender of all the enemy round about this quarter, as they are practically surrounded. Wednesday morning, our hopes were doomed to disappointment, as the Boer guns started merrily. Our artillery soon returned the fire, and we could see the shell bursting close to the Boer guns. This was getting interesting but not so interesting as the fact that we received bread in place of the usual pound of hard biscuits on that day. On Thursday the firing was kept up for a time, and on our left an engagement was in progress, General Hillyard forcing Bothas’ Pass. Desultory firing has been maintained until this morning from Pogwani but, for some reason, all is now quiet. The position the Boers hold is a very strong one, but as we have the men and the guns, I don’t think they will last long. The nights are very cold now … Considering we have to sleep in the open with a couple of blankets only as covering, you may think it is not all honey, and you can scarcely wonder at fellows getting tired of such a life. It is not so bad when in good health, but I am sorry for anyone out here who is not up to the mark, as no comforts are procurable. I am sorry to say we have nearly thirty men in hospital and down the country … The remainder of us and the reserves from the town are in grand form, the beefy ones improving day by day although losing weight more rapid than you would think possible. We are not troubled much about our personal belongings, as the whole of my kit beyond that I stand in comprises one shirt, and one pair of socks. There is a dearth of matches now, and we find our field glasses very useful for lighting our pipes. When a match is struck there is a general rush with paper etc. to obtain a light, which would amuse those at home who get their matches without trouble. The other day, the sun not being very strong, we were unable to use our glasses, several of us stood about waiting to spot a light. A non-com came strolling by charging his pipe and we made safe he would soon produce his matches. As they are now worth 6d a box we could not ask him for one so we quietly followed him for a few hundred yards, so we quietly followed him a few hundred yards, he then stopped, we gathered expectantly, and we were thunderstruck when he asked if any of us had a light. Yesterday as I sat quietly writing, I was disturbed by the sergeant-major yelling for the battalion to fall in quick. I felt sure that the Boers were coming at last, but it was a grass fire, which are very prevalent here … I have slept in a tent twice during the time I have been out and always sleep in boots and dressed. When not too cold, it is not unpleasant to sleep outside, and gives one who is so inclined a splendid chance to study astronomy, not much in my line … I often wonder how it would feel to sleep in a soft bed again, but I doubt if we could sleep any sounder than we do now, even though we have 150 rounds of ammunition for a pillow, and often with our rifles by our side. Though we have a lot of hardships and discomforts to put up with … we have had things easy compared with our comrades who were in the siege [of Ladysmith]. I should like you to see the company now, ragged and rough no soles on the boots, and bare knees and a display of shirt in the rear of their persons is a common sight, but those who are left are thoroughly fit for anything they may be called upon to do. With best wishes to all old friends and thanking you for kind wishes. P.S. The Boers are hard at work sangar building on Pogwani, which accounts for their silence. Have just heard of a reverse farther north. I don’t believe it. G.E.M. Many ladies and gentlemen have by them old or disused teeth, which might as well be turned into money. Messrs. R. D. & J. B. Fraser of Princess Street, Ipswich (established since 1833) buy old false teeth. If you send your teeth to them they will remit to you by return of post the utmost value; or, if preferred, they will make you the best offer, and hold the teeth over for your reply. More from my Great-Grandfather in South Africa. This piece of what we would nowadays call “citizen journalism” was originally published in the ‘Hinckley Times’ of 2 June 1900, two months after it was written, having, presumably, been brought home by sea. I think I can detect a hint of asperity creeping into his tone at times. I expect Easter holidays are over now at home, but with us they have not yet begun, nor do we expect they will until the war is over. It is very kind on the part of the Brigadier, or whoever it is, that is responsible for the moving about we have had. It is done, no doubt, with the intention of showing the service company as much of the company around Ladysmith as possible. We have made another move, close by Gun Hill, to a place pleasantly situated on the plain, but there is a scarcity of water which seems the usual order of things wherever our camp is situated. On the Thursday before Easter, we marched straight from outpost duty to Surprise Hill camp, to find our regiment about to march off. We trudged away through Ladysmith round to the left, over the Klip River, and away towards Bulwana. We arrived in time to pitch our tents before dark, feeling tired, thirsty and fairly disgusted with old Kruger and things in general. Having had no dinner, tea was thoughtfully served out about eight o’clock, and we relieved our parched thirst with one pint of that beverage to about five men. After drinking this enormous quantity, of course we could not find room for eatables, and even in this matter, and considering our tired feeling, we were saved all trouble in drawing rations by the thoughtfulness of the Commissariat Department, who had provided none to draw. However, we lay down and slept the sleep of the just. The next day being Good Friday we had a holiday and indulged in the luxury (perhaps not for the officers but the men) of a good wash, and some, more daring than others, even had a shave. But all things come to an end, and so did our holiday, for at three o’clock we had orders to fall in with blankets in addition to our usual marching order, to go out on 48 hours’ outpost duty. As soon as were ready, we fell in, after trying to swallow the scalding liquor, and marched for a mile or so through a country full of prickly shrubs, then up and down and across ravines for another mile or so, round Gun Hill, then up to Lombard’s Kopje, stumbling over loose stones, clambering over loose rocks, until we reached the top, sweating and panting with the beneficial and much-needed exercise under the burning sun. We never had the unnecessary privilege of taking our kit off for a few minutes. Then again we fell in, and, carrying our blankets under our arms we marched to the places allotted to us for outpost duty, we remained for the night, on the look out for our friends who did not come. We came off outpost duty at 6.30 on Saturday morning, and feeling much benefitted by our climbing on Good Friday, we entered heartily into the agreeable pastime, so popular with soldiers in Natal, of sangar building. [A sangar is a temporary fortified position.] This is a very simple form of amusement. All the requisites you need for this game are a few picks, shovels, and a crowbar or two, the larger the crowbar the more exciting the game … When three men lift a stone large enough for six, and get it within a foot of the top, and cannot get it any further, excitement runs high, and it is most amusing … but the most amusing part of this programme is just at the time of finishing, you get placed offside by the referee, generally an officer, and you pull the sangar down and commence as before. Well, we started playing on Saturday morning at one o’clock, and went on, with interval, until twelve o’clock, when we had breakfast. We resumed until dark with a few minutes for meals. We then went on outpost duty, but resumed the game early on Easter Sunday with vigour until tea time, when we shouldered our belongings, and went for a pleasant stroll down the hill to the camp, where we stopped for the night. At 5 am on Bank Holiday, we were on parade with our rifles and ammunition in case our neighbours should pay us a holiday visit. We waited for them until the sun rose, about 6 am, but they failed to come, so we had breakfast. We then proposed to go on with the sangar building and proceeded to our recreation ground at the top of Lombard’s Kopje, where we remained all day, and strolled down to the camp for the night. On Tuesday our friends again disappointed us, and we set off up the hill for another sixty hours’ outpost duty, relieved by sangar building, and as the night was very wet, and we were not provided with waterproof sheets, it was quite funny to feel the water trickling down our backs and over our faces, and was even more laughable still, to get up and shake the water from our one and only blanket, and then lay down, again. The odds were ten to one you had a sharp stone in the centre of your back, or in a more tender part of your anatomy. The next night there was even more rain than usual, and the greater part of the time was spent in watching the rain, which presented this pretty sight. We had the opportunity of washing our faces with the raindrops as they beat down. As long back in the dim past as three months ago each of the service company were served out with 2 pairs of boots, not the common or garden boot, as served out to the troops. Oh, dear no, a far superior article to those, as thanks to the Equipment Fund, which was so generously subscribed to by the good people of Leicester and Leicestershire, it was determined to send out the company as well-shod as possible, regardless of expense. That they have succeeded in doing so is beyond all doubt, as there are several pairs of boots which have not worn out, notwithstanding that they have travelled some thousands of miles, truly, mostly on sea, where they were not worn. However, it is a fact that one man has completely worn out both pairs of boots issued to him, but it is reported he did not take the necessary care of these, the most important and valuable part of his outfit. That is quite possible, but I, myself, cannot believe it, as I saw him on parade when he had taken the precaution to tie the souls [sic] on with a piece of string. If that is not being careful I should like to know what is. One of our men declares that there must have been a mistake made, and that he had secured a pair which had been made for wearing when riding only, and as he had worn each pair for quite a month for marching, he may consider himself lucky in being allowed the privilege of paying for a new pair out of his own income. Notwithstanding such pleasures of which the above are but a few, we all have our serious moments, and realise that we are out on active service and when we hear the boom of the guns, but a few miles from us, we are all determined to show that if it comes to fighting, we will prove ourselves worthy of the regiment to which we belong. When asking for Cocoa, insist on having CADBURY’S – sold only in Packets and Tins – as other Cocoas are often substituted for the sake of extra profit. When time is short and inspiration runs low, it helps to be able to call on the services of a guest blogger, so let me introduce my Great-Grandfather (my Mother’s Father’s Father), George Mustin, or, as he was at the time of the above photograph, Cpl. G. E. Mustin of the Leicestershire Infantry Volunteers. At the time he was (topically) in South Africa, having joined up to fight in the Boer War with some friends from the Hinckley Liberal Club. The Liberals were split into pro- and anti-Boer factions: he cannot, I imagine, have been particularly pro-Boer, given that he had volunteered to try to kill them, but he mainly seems to have joined up in search of more dramatic excitements than Hinckley could offer him. The first letter dates from 4th April 1900, when he had just arrived in South Africa. The first phase of the war had gone badly for the British, who were, as usual, outnumbered and unprepared. They responded by attempting what we would now call a “surge”, shipping in troops in from other parts of the Empire, calling up the Yeomanry and making a general appeal for volunteers. This usefully revealed that 40% of the would-be recruits were physically unfit for service, due to the appalling condition of (in particular) the urban poor. George Mustin was made a Corporal, partly, I think because he was an excellent shot, but also, perhaps, because he was unusually tall for the time at about 6’3″, and, presumably, in good health. The Volunteers arrived shortly after the relief of Ladysmith by Sir Redvers Buller (who was widely criticised for the length of time it took him to get there and shortly sacked). The letters were addressed to a Mr. A. Taylor (a “prominent local Liberal”) and published in the ‘Hinckley Times’ under the heading “Correspondence from the War”. What strikes me most is how frank he was able to be about his experiences, which consisted mainly of hunger, thirst, discomfort and boredom, though the tone is leavened with late-Victorian facetiousness. The general impression is of the front-line sections of “Homage to Catalonia”, as re-written by Jerome K. Jerome. “Mr. A. Taylor, a prominent member of the Hinckley Liberal Club, has just lately received the following letter from Corpl. G.E. Mustin, a member of the Club and who is one of the “L” Company Volunteers at present serving with the colours in South Africa. Dear Mr. Taylor, – as I promised to write to the Club, I hope you will pardon me troubling you in addressing this letter to you. P.S. You must excuse writing (pencil) as all my materials are at Pietermaritzburg.